All too soon, Tori and Eric realize that atheir marks are only the first clue to a mystery that will change everything. And with each new discovery, Tori finds herself pulled deeper and deeper into a world she could never have imagined. The premise of The Mark intrigued me. The book capitalized on that premise. Each new discovery made me want to read more. There was a bit of suspense, a whole lot of mystery, and times when I just had to ignore my cute boys and keep reading. The romance reminded me a bit of Twilight. A young girl who's never been in love, then falls so hard she can't handle being apart from her boyfriend. Thankfully Tori has her own talents and abilities so she isn't completely dependent and Eric is really cute, even if I could be his mother (it's hard getting old). As an adult I really enjoyed this book, but I'm betting it's going to explode in the YA market. I will definitely share it with my nieces. The book is set up for a sequel. I'm excited to see what happens to Eric and Tori next. 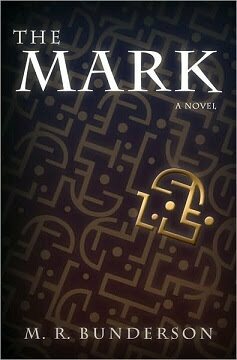 Win your free copy of The Mark: Marilyn has generously offered an autographed copy of The Mark to one of my followers. Just leave a comment on this blog post to be entered. Thanks, friends. I hope you enjoy The Mark. If you've read it, please share your own thoughts. I follow, and I've really wanted to read this book. I'm a follower! You've sold me on it. I'm a follower and this book sounds great! I would love to read it. I'd love to own this fabulous story. Thanks for doing a giveaway. I referred msdarcy22 to your blog. This looks like a great read. Thanks for the review and the contest! You might also enjoy a new science fiction book coming out June 18th called, "Minder," which is about psychic espionage. It's the first one in a series and should be very exciting. I enjoyed your post and i'm interested in this book. Thanks for the entries, my friends. Audrey - I'll check out your link to Minder. Thanks! I can't wait to read this book. Enter me in the giveaway please. I sense mystery/suspense in this story. The Mark sounds like a wonderful read. Please include me in your giveaway. Heidi of Heidisblog sent me here! Fun to see more entries. Heidi - I completely agree with you. My husband just got put in as 1st counselor in the bishopbric. I said, "We're not old enough for this." Then I realized, darnit we are! Thanks, Christy and Jan for following. I just realized I hadn't put a date on this contest. It will close June 6th so there's still plenty of time to enter. Brand new follower-- just because I wanted to enter for this give away. I also shared the give away on facebook... so that's all worth a few entries, right? I REALLY would love to read this book! That counts for something, too, right? Thanks, Angicle. Glad to have you follow. I'm heading to integer to pick a winner right now. I'll let you all know soon.